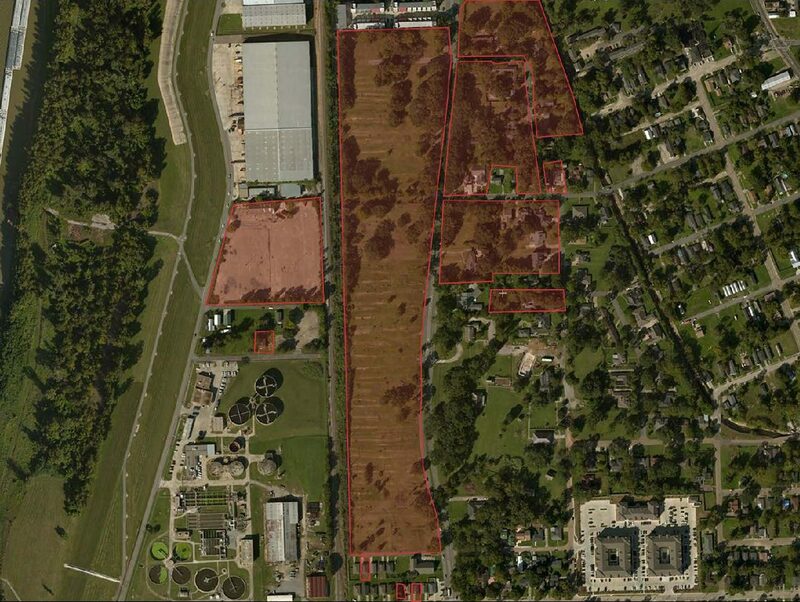 All 42 acres comprising the long-stalled River District—a planned mixed-use development straddling Nicholson Drive between LSU and downtown—are now being packaged as one tract, a move those marketing the site hope will generate more interest in the property. NAI Latter & Blum, which represents the seller, is partnering with Lafayette-based Hargroder Real Estate to pair the primary 32-acre property with another 10 acres owned by Carencro businessman Carrol Castille, which encompassed the remaining 25% of the original PUD. It’s a subtle move, but one the sellers’ hope will spark interest on a property that’s been quietly sitting on the market for a year. Some in the real estate community hypothesize a sale has been hard to come by due to land’s comparatively high $25-per-square-foot asking price, coupled with complicated planning arising from having to execute multiple transactions with different owners. Now, however, the 42 acres, comprised of three contiguous tracts—one each on either side of Nicholson, and a third on the other side of the railroad tracks—are being packaged as a single sale, making it easier for an individual investor to develop. It also marks the latest development in the long saga to develop the property, which began in the early 2000s when Lafayette businessman Michael Moreno began acquiring the land in 50 separate transactions totaling $23 million. He and his sister, Dalis Waguespack, had envisioned transforming the property into The River District, a development linking LSU to downtown. But after the Great Recession hit and oil prices plunged, Moreno faced business problems. Then in July 2015, Goldman Sachs sued Moreno for defaulting on a $52.4 million loan that, in part, had financed his acquisition of the Nicholson Drive property. The bank bought back the property for $20 million in Feb. 2017. In the meantime, Gose says he’s received some interest in the property but declines to get into specifics other than confirming they all want to “keep the [River District] plan in place.” However, he expects the sale to attract more buyers now that it’s in one piece.